I have read “Below the Clock” three times, and each time I have had the feeling that there has been something new to surprise me, yet every time I have found myself disappointed. This classic detective story has some very good points: a murder in public, a poisoning, a lot of talk about a special drink, a strange way of surprising a politician (as good as some of Philip Levene’s scripts for John Steed and Emma Peel in The Avengers), and finally the administration of the fatal dose. It also has a lot of talk, an absence of confrontation, unpleasant characters hanging round without being challenged, and – worst of all – a detective with whom one cannot identify. Reprinted in Collins Crime Club series, the first readers of Below the Clock did not feel the way I do. It was published in May 1936 and demand was so high that it had to be reprinted the same month. Then perhaps it fell off a cliff. 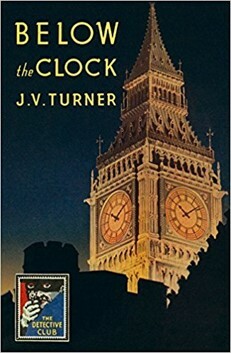 There were seven books featuring Turner’s detective, Amos Petrie from the office of the Director of Public Prosecutions, and this was the last. “J. V. Turner” was the author’s real name, but he is best known as David Hume who, before his early death in 1945, wrote at least 35 thrillers, none of them memorable. Petrie must owe something to Edgar Wallace’s Mr J. G. Reader, though he has some of the small physical appearance of Anthony Weymouth’s Inspector Treadgold. Petrie has the appeal of neither of them, though. The murder should be more interesting than it is: the Chancellor of the Exchequer is delivering his budget speech (presumably for 1935). It has taken an hour to give his historical review, he then hesitates, then drops dead before he can announce the tax changes due. Strangest of all for a reader today is the near complete absence of party politics, although it is assumed that there is a government and an almost equal opposition (the Shadow Chancellor thinks he could be in power after the next election); when in reality Baldwin’s National government controlled almost all the House. Any reference to events on the continent is pointed toward dodgy liaisons, possible bigamous marriages and blackmail rather than thoughts of re-arming against fascism. Curiously the murder of a Chancellor of the Exchequer in 1936 was not regarded as a security matter. Looking back, the reason for the Chancellor’s hesitation at the despatch box is the most interesting and the most cunning device, and the administration of the poison along with the misdirection of other vectors, a rather close second. Overall, though, these revelations leave a reader un-shocked. Below the Clock is told in a low key style and ultimately feels low spirited. Only if you like your spritzers well-watered may this be the rediscovery for you.